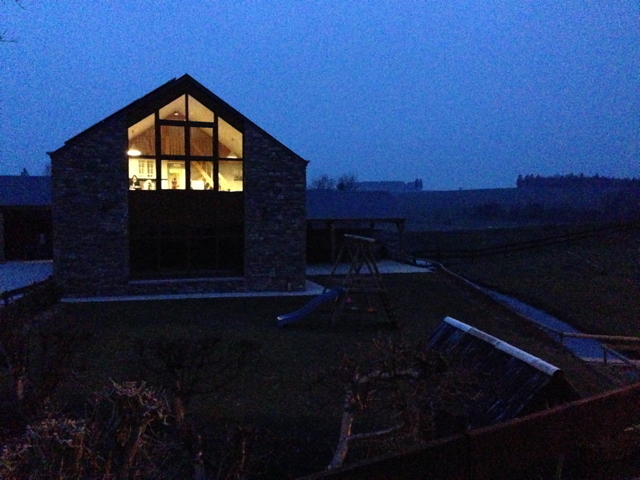 Escaping the worst UK spring on record for rural Belgium might not be your idea of fun. In fact, it's almost certainly not, unless you like chips/French Fries ('frites'), high alcohol-content beer or billiard-table-smooth, deserted roads over rolling hills and through winding river valleys. Laval is near Tillet, just to the west of Bastogne, which is just to the west of Luxembourg, which is between Germany, France and Belgium. Three hours on motorways from Calais, traffic around Brussels willing. Hopefully that sets the scene. Breaking the hike from Calais in Brugge is always recommended, as Brugge is a stunning world-heritage site and also is home since 1564 to one of the best Belgian breweries, De Halve Maan ("The Half Moon"), where they make Straffe Hendrik Quadrupel, an 11% beer best described as bottled heaven, for only about €4.50 per 750ml. Wives and children can be amused with a coach & horse tour of the town while serious business is conducted. Ahem. Hic. As you drive east toward Bastogne past Brussels the hills start to appear, slowly at first then with 'hey, Belgium is quite hilly isn't it' regularity, increasing past 'The North/South Downs are like this' to 'er, what was your smallest gear again?' with occasional bouts of 'Begorrah I'm glad I'm in a car for this one'-grade valleys. Our base for a week's family holiday in the Ardennes was the Moulin Gite at Laval, a complex of five tastefully-done old- and one new-build holiday homes with a shared indoor saltwater heated pool and playground in a lovely rural setting. As a family or group base it's highly recommended. You can book the whole place if you like, or just the one. Free WiFi is limited to one public spot downstairs in the Moulin building, but works in the upstairs bedroom there. Mobile coverage is patchy. It's a 10 minute drive to Bastogne which has everything you're likely to need including a good bikeshop, a 24hr laundrette, loads of surprisingly posh shopping (€3,000 Tissot watch, anyone?) and a selection of supermarkets/petrol stations. If you'd like to stay here, get in touch using the 'Contact Me' button on the right. We have a discount code for friends that will get you €30 off your rental. You'll need to take sheets/towels/teatowels, kitchen stuff including dishwashing kit / tablets, toilet paper, and probably better pillows if you are fussy. All houses have fires apart from the Moulin, which is an eco-house with underfloor heating. The pool (10am-6pm) also has a nice sauna. €150 deposit gets refunded into your bank a week after leaving if you didn't break anything. You can pre-pay cleaning, which is recommended. The owner lives over the road, and is a personable enough bloke. The Tripadvisor reviews seem to be half-made up of people who didn't understand the T&C's, hence the either 'great' or 'crap' ratings. Day 1 was spent firstly in Bastogne acquiring Everything We'd Left Behind, coffee, cake, then a swim. An afternoon trip to the massive Wallonia open-air museum at Fourneau Saint Michel wore the kids out, and raised an adult eyebrow or two in the re-created rural knock-shop exhibit. This was no National Trust place, that's for certain. The playground there is rather amazing, and during summer when they have horses in residence it must be packed. Recommended for all ages. Laval is at a crossroads, which means great riding in all directions. Which is what this is all about. Ride 1 was a stunner, albeit a minus-two-degrees stunner. Not wanting to miss out on riding time and mindful of spousal mutterings about abandoning families on the second day, I departed as early as clothing would allow. 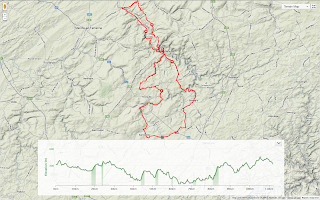 The route was to head up to La Roche, cross over the Ourthe valley and loop around Hotton, returning back along the Liege-Bastogne-Liege route from La Roche. About 110km and 2,000m climbing all-up. 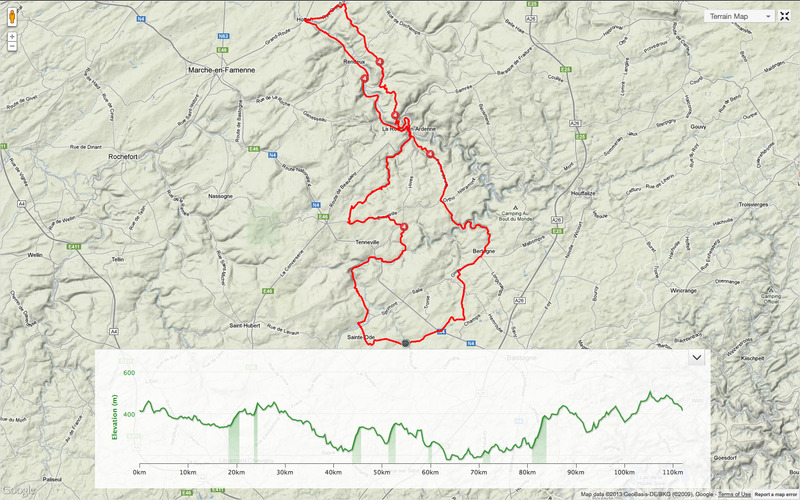 Here's the Strava info on the ride, and here's the Viewranger route/map. Viewranger was used to plan the ride, incorporating as much of the excellent opensource Rando Velo 7 route as possible. If you aren't familiar with Viewranger, it's a genius online cycle route planner that then syncs with the matching smartphone app so you can follow the route. You can download free Open Streetmap tiles before departing, so you have your entire route and surrounds for offline reference. Make sure to leave the app open to download all the tiles, and check beforehand they are all there. OS Topomap map tiles can be purchased if desired. From the outset I was amazed at the quality of the roads in the Ardennes. Most were of far higher quality than any UK road, and some approached billiard-table-like smoothness. Sections needing a bit of repair were notable exceptions and quickly forgotten. Following a Rando Velo route for the first half of the ride meant almost no cars at all - maybe 5 in the first 50km to La Roche. as the weather had been dry the previous day mudguards were removed, and not a trace of moisture was evident on the roads - a rare treat after the UK's dismal winter and 'spring'. Arrival in La Roche was preceded by the obligatory valley of static caravans that seem to radiate out from anywhere even remotely scenic in the Ardennes. In the summer most of Belgium and the Netherlands apparently turn up to experience hilly nature at its best, by staying 6 feet from other Belgians / Dutch in beige plastic and Aluminium boxes. Probably eating waffles and drinking too much. La Roche is a very pretty town complete with rather fetching ruined castle and a nice central eating/drinking area, although at 9:30am on a Sunday it was rather empty so no stop was made. The climb up out of the valley was mercifully quick, and after some confusion as roads were closed in a village for a local fete and the normally unflappable Open Streetmap tried to route me down a farm track, Hotton approached. Things should not look like this. About 3km outside Hotton, on a dead-flat, straight section of road, disaster [almost] struck. The bike's gears jammed up, in what felt for all the world like chainsuck. Normally a quick backpedal would sort this, but it's very fortunate no effort was exerted before stopping to have a proper look. The resulting mess of mangled front derailleur and chain along with bent frame braze-on filled the heart with woe, foreboding of large bills and curses. No practical explanation was found for why the front mech decided to so spectacularly attempt to rip itself from the bike in this manner. Frites. It is Belgium, after all. Half an hour later after some judicious bending, tweaking and more cursing a jerry-rigged setup seemed to work in the large ring only, and didn't threaten to pureé the remaining hardware. With increasing speed and confidence Hotton was reached and in honour of over a century's worth of Liege-Bastogne-Liege competitors, Frités were obtained and consumed. Then it was on down the valley back to La Roche, on what was by far the busiest section of road so far. La Roche is a favourite destination for fair-weather tourists and motorbikers, and in summer this road would probably best be avoided entirely. From La Roche the 150m Category 4 climb up onto the plateau between there and Bastogne was a surprisingly quick affair, what with not having any other option but to use the big ring. Any pretence that this was 'normal' was put paid by a heart rate of 'technically dead' percent and the knowledge that the only thing worse than pedalling would be walking up the hill in cleated roadcycling shoes pushing a bike. The rest was a blur of rolling hills through small villages back to Laval, 112km under the wheels in glorious sunshine. Catching the last hour of Paris-Roubaix (in Dutch for authenticity) while sipping a Rochefort Trappiste was pure icing on the cycling cake. Here's a full set of photos and a map, to give you the full picture of what the ride was like. Luxembourg City - wow. Just...wow. It was a nice surprise to discover that the posh but understated building opposite our mid-morning cafe was in fact the residence of the Luxembourg head of state. Just the one armed soldier outside, who did a good job of not reacting to our kid's increasingly enthusiastic attempts to get a smile out of him. After the all-day epic of Ride 1 the spousal tolerance tank was running low, so a shorter 50km loop was planned in Viewranger. The fact it was torrential rain forecast might also have had something to do with it. A good test for the new Shutt Velo Rapide Performance jacket then - close to zero, high winds, lots of moisture. And matching Roubaix fleecy tights too. I was a bit nervous about riding out with just one layer under the jacket (the Merino/poly mix Shutt LS top) but the combo of Merino top and Performance jacket worked perfectly. This was a quick, hilly ride (avg speed of 25.6km/hr & 835m climbing) and the combo did a good job of not feeling sweaty-clammy whilst keeping the nasty weather out. A Buff headscarf-thing under a Shutt Yorkshire Tweed cap kept the head toasty warm and rain more or less out of the eyes. One thing is abundantly clear: use mudguards in the Ardennes if it's wet. The roads were mostly excellent, but excellent covered in cow poo and mud is still...well, covered in cow poo and mud. I cannot understand the aversion some cyclists have to putting excellent mudguards like the SKS Raceblade Long (£45) on a £3,000 bike wearing £500 worth of kit. Without guards both end up looking like the rider has previously ingested an industrial-strength laxative, and certainly would not be welcome in any respectable cafe mid-ride for coffee and cake. Which is what cycling is all about, of course. Photos and map to be had here. The next day was an excursion to the World's Smallest Town of Durbuy (pop. 400), also vying for World's Most Ridiculously Photogenic Cobbled Streetscape and World's Largest Topiary Garden. Although apparently they already won that last one, certainly in the 'Portrayal Of Self-Propelled Aquatic Craft' category. Plus waffles and beer from the micro-brewery. Then from Durbuy back home, via a demonstration of the Belgian national passtime of 'Incendie Station d'Essence Confitage'. Then in the afternoon, a quick 30k spin around the area to the north and east under cloudy but not rainy skies. Climbing out of the Laval valley through dark pineforests on smooth, silent roads was a perfect way to begin, followed by what can only be described as several stretches of molten cycling joy. The feel of buttery-smooth fresh tarmac under the wheels of a long gradual descent that lets you push the highest gear is as close to flying as I can imagine. The total lack of cars on a road wide enough to be a UK dual carriageway obviously lent itself to swerving back and forth across the whole road at increasingly sharper cambers, the Continental Ultrasport/Gatorskin combo never giving the slightest hint of Teutonic complaint. A minor deviation from the planned route was no issue, the second mislabeled road in the otherwise excellent Open Streetmap database being easily rectified. The photos of the ride don't do justice to how much fun was had. On the whole the Ardennes were a fabulous family and cycling holiday destination, well off the UK-centric beaten path and well worth a return visit. If my UK tax pounds end up funding the laying of tarmac like this in the backwoods of Euroville for my cycling holiday edification, I'm OK with that. Where can I pay more, please?